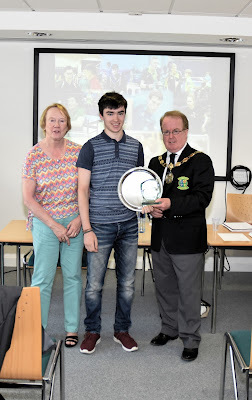 Donie Mullally received the Vivenne Barry Fair Play Award 2015 at the ITTA AGM on June 13th. During this year’s Munster Open, Donie finished third in his U-18 first round group (by the tightest of countbacks). Due to an oversight, a UCD player was unfortunately overlooked in the Plate draw and the player that he should have played went on to meet Donie in the Plate quarter final (a match which Donie won). Only after this match, was it realised that this UCD player had not had his last 16 match. The player that UCD should have met had left the arena by the time this became apparent, unaware that anything was amiss. When Donie was approached he agreed immediately to play him even though Donie was already in the Plate semi-final. He knew that if he lost, he would not even have the consolation of success in the Plate. Donie won comfortably, but it displayed his great sportsmanship by agreeing to play, especially when he had already been disappointed not to make the main knockout event. Congratulations to Donie - the club is proud!